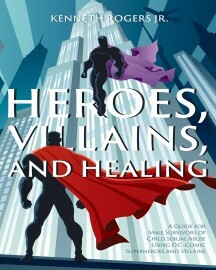 Heroes, Villains, and Healing: A Guide for Male Survivors of Child Sexual Abuse Using D.C. Comic Superheroes and Villains – by Kenneth Rogers Jr.
1 in 6 males will be sexually abused in their lifetime. This fact is often ignored or not believed. Heroes, Villains, and Healing is a guide to help male survivors of childhood sexual abuse understand and heal from the trauma of their past using DC Comic Book superheroes and villains. This helpful book is divided into three parts. The first is “Heroes,” which explains how some coping strategies of male survivors are similar to the archetypes of such DC superheroes as Superman, Batman, and the Flash. The second part, “Villains,” examines how other coping strategies may not be as positive, having traits and attitudes of villains such as Lex Luthor and the Joker. “Healing” is the final part, which explains how striving to live the life of a hero or a villain can be sustainable. To truly heal from childhood sexual abuse means working through the stages of healing and receiving help from a therapist or counselor. This final section includes writing exercises and examples that help male survivors know they are not alone, as they come to terms with their abuse and heal from past trauma. The book was written to help male survivors open up about their abuse, seek help, and stop suppressing their trauma through drug and alcohol abuse, or suicide. Keywords:- Sexual Abuse, Male, Survivor, Comics, Superheroes, Villains, Healing, Self-help.